Carol Gravens will be our February 2019 guest speaker and will give a program entitled Orchids: Lore and Legend. 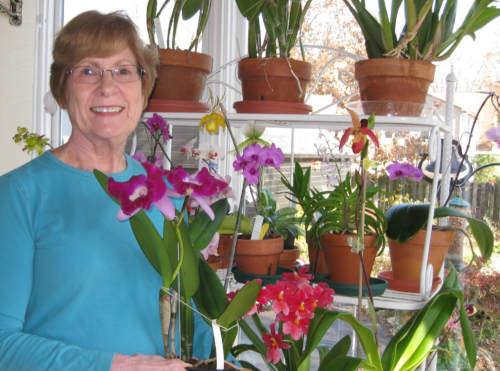 Carol Gravens gives talks and teaches classes on orchids to various groups in the community and at the Missouri Botanical Garden as part of the Master Gardener Speakers' Bureau. She volunteers one day a week in the orchid greenhouses at the Garden and grows orchids at her home in Glendale, Missouri. She also is a Kemper Center Plant Doctor volunteer. She loves everything about horticulture and has a passion for orchids. Ms. Gravens, retired from a professional career as a microbiologist, and is currently an Advanced Level St. Louis Master Gardener. She became a Master Naturalist in 2007 and has an AAS in Horticulture from St Louis Community College, Meramec.